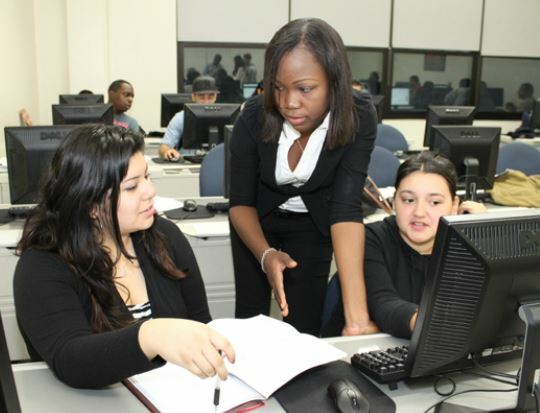 Professor Lorraine Mastracchio is the Senior Chairperson of Faculty and Curricula at The College of Westchester, where she teaches Office Technologies courses. Professor Mastracchio recently shared an example of how she incorporated a collaborative assignment into one of her courses and how it positioned students to take further ownership of their learning. Here we share this story of active learning and peer instruction. Even though a faculty member may teach the same course throughout the year, each instructor often “tweaks” the course to personalize it based on students’ majors or updated topics for discussion, etc. During the fall 2013 semester, I wanted to change the format of the course and try engaging my new students even more within the course Emerging Information Technology course. In order to prepare them, I lectured on the first two unit topics, used some PowerPoint slides, and then led a discussion followed by an assignment. After the first two units, I decided to “flip” the classroom and have the students research a topic and present on it as the approach to introducing that topic to the class. For the next topic unit, I divided the class into groups of four and gave each group a topic along with subtopics for them to research, as a group activity. The groups were selected through a random process by the instructor, and then they had to self-select within the group to identify a Leader, a ‘Recorder’ (to create the PowerPoint slides), and an Organizer. The others member(s) were researchers. Each group presented their topic to the class. They had to present as a group, with all participants present (some groups had one designated presenter, and some shared presentation duties). I collected each group’s PowerPoint notes and posted them on the college’s LMS in a zip folder, which lead to a discussion on the utility of zip folders. The PowerPoint slides would now serve as study guide notes for the students’ next test. What was the Reaction from Students? As far I am concerned, this method put the ownership of learning on students and gave them an opportunity to practice their teamwork work skills and become active learners. Professor Lorraine Mastracchio is the Senior Chairperson of Faculty and Curricula at The College of Westchester, where she teaches Office Technologies courses. The blog article is informative. There are plenty of things discussed right through the article. The article explores enabling students to acquire ownership of learning – one teacher’s collaborative approach. The article takes a look at a group assignment to construct their own learning and teach each other. The blog guides you to an example of what happens when teachers integrate a collaborative assignment into one of the courses and how it positioned students to take further possession of their learning.